Termites are the second-largest natural source of methane, a greenhouse gas. 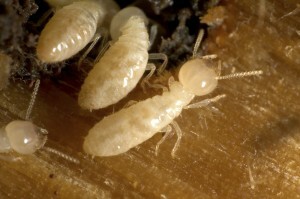 Worker termites feed on wood and then feed the rest of the colony by regurgitating. Termite damage is rarely covered by homeowners insurance. 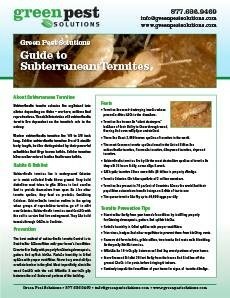 Termites live in underground colonies and tunnel to wood sources — trees, buildings or any source of cellulose. More than 5 million homes in the United States have some type of termite problem each year. The termites on Earth outweigh the humans on Earth. Worker termites forage randomly and continuously for food, sometimes traveling up to 350 feet from the colony, and can thoroughly cover a territory up to a half acre in size. Termites have survived since the days of the dinosaurs. A termite colony can number from the thousands to millions. Termite damage is more common than damage caused by fires, storms and earthquakes. In the United States alone, an estimated $5 billion in termite-related property damage occurs annually. Termites do not sleep. They work 24 hours a day. Termites can squeeze into your home through cracks as small as 1/32 of an inch. Don’t wait until it’s too late; schedule your free termite inspection today! Call Green Pest Solutions at 877-636-9469 to speak with one of our friendly and knowledgeable pest control professionals!